This is a lab session, where we’re going to implement a memory allocator, similar to the one used in malloc function. In addition, we discuss the theory behind the allocators, talking about sequential (aka “bump allocators”), and the free-list allocators. From the Lecture 5 we know that a garbage-collected program is manipulated by the three main modules known as Mutator, Allocator, and Collector. Mutator is our user-program, where we create objects for own purposes. All the other modules should respect the Mutator’s view on the object graph. For example, under no circumstances a Collector can reclaim an alive object. Mutator however doesn’t allocate objects by itself. Instead it delegates this generic task to the Allocator module — and this is exactly the topic of our discussion today. 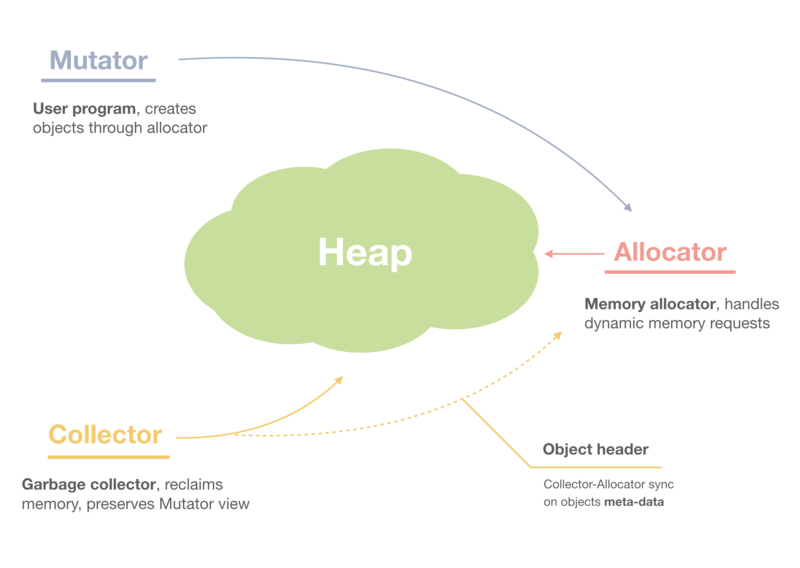 Let’s dive into the details of implementing a memory allocator. From a memory allocator perspective though, which works at lower-level, an object is represented as just a memory block. All is known is that this block is of certain size, and its contents, being opaque, treated as raw sequence of bytes. At runtime this memory block can be casted to a needed type, and its logical layout may differ based on this casting. Recall from the lecture devoted to the Object header, that memory allocation is always accompanied by the memory alignment, and the object header. The header stores meta-information related to each object, and which servers the allocator’s, and collector’s purposes. * can be 4 or 8 bytes. * and the actual payload pointer. * Whether this block is currently used. * Next block in the list. As you can see, the header tracks the size of an object, and whether this block is currently allocated — the used flag. On allocation it’s set to true, and on the free operation it’s reset back to false, so can be reused in the future requests. In addition, the next field points to the next block in the linked list of all available blocks. The data field points to the first word of the returning to a user value. The objects A, and C are in use, and the block B is currently not used. * Heap start. Initialized on first allocation. * Current top. Updated on each allocation. Shall I use C++ for implementation? As mentioned, when allocating a memory, we don’t make any commitment about the logical layout of the objects, and instead work with the size of the block. * Allocates a block of memory of (at least) `size` bytes. Why is it “at least” of size bytes? Because of the padding or alignment, which we should discuss next. For faster access, a memory block should be aligned, and usually by the size of the machine word. If you haven’t watched the Lecture 3 yet about the object header and alignment, please do so for a better understanding of the further discussion. * Aligns the size by the machine word. What this means, is that if a user requests to allocate, say, 6 bytes, we actually allocate 8 bytes. Allocating 4 bytes can result either to 4 bytes — on 32-bit architecture, or to 8 bytes — on x64 machine. OK, so far so good. Now we need to recall the topics of virtual memory and memory mapping, and see what allocation actually means from the operating system perspective. From the Lecture 4 about virtual memory of a process, we remember that “to allocate a memory” from OS, means “to map more memory” for this process. Let’s recall the memory layout again, and see where the heap region resides. As we can see, the heap grows upwards, towards the higher addresses. 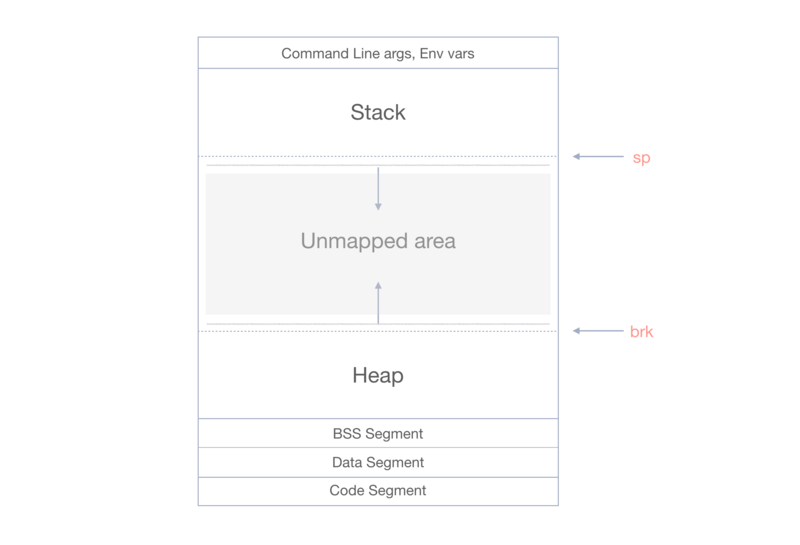 And the area in between the stack and the heap is the unmapped area. Mapping is controlled by the position of the program break (brk) pointer. There are several system calls for memory mapping: brk, sbrk, and mmap. Production allocators usually use combination of those, however here for simplicity we’ll be using only the sbrk call. Having current top of the heap, the sbrk function increases (“bumps”) the value of the program break on the passed amount of bytes. * the Block structure (object header + first data word). * only one word, it's fully in the Block struct. * Requests (maps) memory from OS. By calling the sbrk(0) in (1), we obtain the pointer to the current heap break — this is the beginning position of the newly allocated block. Next in (2) we call sbrk again, but this time already passing the amount of bytes on which we should increase the break position. If this call results to (void *)-1, we signal about OOM (out of memory), returning the nullptr. Otherwise we return the obtained in (1) address of the allocated block. To reiterate the comment on the allocSize function: in addition to the actual requested size, we should add the size of the Block structure which stores the object header. However, since the first word of the user data is already automatically reserved in the data field of the Block, we decrease it. We’ll be calling requestFromOS only when no free blocks available in our linked list of blocks. Otherwise, we’ll be reusing a free block. Note: on Mac OS sbrk is deprecated and is currently emulated via mmap, using a pre-allocated arena of memory under the hood. As one of the assignments below you’ll be suggested to implement a custom version of sbrk, and also on top of the mmap call. * Returns the object header. // A request for 3 bytes is aligned to 8. In (1) the allocation size is aligned to the size of the word, i.e. 8 on x64. In (2) it’s already aligned, so we get 8 too. OK, looks good. Yet however we have one “slight” (read: big) problem in this naïve allocator — it’s just continuously bumping the break pointer, requesting more, and more memory from OS. At some point we’ll just run out of memory, and won’t be able to satisfy an allocation request. What we need here is an ability to reuse previously freed blocks. Note: the allocator from above is known as Sequential allocator (aka the “Bump”-allocator). Yes, it’s that trivial, and just constantly bumping the allocation pointer until it reaches the “end of the heap”, at which point a GC is called, which reclaims the allocation area, relocating the objects around. Below we implement a Free-list allocator, which can reuse the blocks right away. We’ll first look at objects freeing, and then will improve the allocator by adding the reuse algorithm. * Frees a previously allocated block. The free function receives an actual user pointer from which it obtains the corresponding Block, and updates the used flag. Plain simple. OK, now let’s finally implement the reuse functionality, so we don’t exhaust quickly all the available OS memory. Our free function doesn’t actually return (unmap) the memory back to OS, it just sets the used flag to false. This means we can (should!) reuse the free blocks in future allocations. The actual reuse functionality is managed in (1) by the findBlock function. Let’s take a look at its implementation, starting from the first-fit algorithm. The findBlock procedure should try to find a block of an appropriate size. This can be done in several ways. The first one we consider is the first-fit search. The first-fit algorithm traverses all the blocks starting at the beginning of the heap (the heapStart which we initialized on first allocation). It returns the first found block if it fits the size, or the nullptr otherwise. * Returns the first free block which fits the size. * Tries to find a block of a needed size. The first found block is returned, even if it’s much larger in size than requested. We’ll fix this below with the next- and best-fit allocations. // the previously freed block. assert(p3b == p2b);  // Reused! Make sure all the assertions still pass. Now let’s see how we can improve the search of the blocks. We consider now the next-fit algorithm, which will be your first assignment. Below are the assignments you’ll need to implement in order to complete and improve this allocator. The next-fit is a variation of the first-fit, however it continues the next search from the previous successful position. This allows skipping blocks of a smaller size at the beginning of the heap, so you don’t have to traverse them constantly getting frequent requests for larger blocks. When it reaches the end of the list it starts over from the beginning, and so is sometimes called circular first-fit allocation. Again the difference from the basic first-fit: say you have 100 blocks of size 8 at the beginning of the heap, which are followed by the blocks of size 16. Each alloc(16) request would result in traversing all those 100 blocks at the beginning of the heap in first-fit, while in the next-fit it’ll start from the previous successful position of a 16-size block. On the subsequent request for a larger block, we find it right away, skipping all the smaller blocks at the beginning. * Mode for searching a free block. * Previously found block. Updated in `nextFit`. * Reset the heap to the original position. // Roll back to the beginning. * Initializes the heap, and the search mode. * Returns the next free block which fits the size. * Updates the `searchStart` of success. * Tries to find a block that fits. // Init the heap, and the searching algorithm. OK, the next-fit might be better, however it still would return an oversized block, even if there are other blocks which fit better. Let’s take a look at the best-fit algorithm, which solves this issue. The main idea of the best-fit search, is to try finding a block which fits the best. For example, having blocks of [4, 16, 8] sizes, and the request for alloc(8), the first- and the next-fit searches would return the second block of size 16, which unnecessary wastes the space. Obviously, returning the third block of size 8 would fit the best here. Note: below we’re going to implement blocks splitting, and the block of size 16 from above would result in splitting it on two blocks of size 8. The first free block is skipped here, being too large, so the search results in the second block. * Returns a free block which size fits the best. OK, looks better! However, even with the best-fit we may end up returning a block which is larger than the requested. We should now look at another optimization, known as blocks splitting. Currently if we found a block of a suitable size, we just use it. This might be inefficient in case if a found block is much larger than the requested one. We shall now implement a procedure of splitting a larger free block, taking from it only a smaller chunk, which is requested. The other part stays free, and can be used in further allocation requests. Our previous first-fit algorithm would just took the whole large block, and we would be out of free blocks in the list. With the blocks splitting though, we still have a free block to reuse. * Splits the block on two, returns the pointer to the smaller sub-block. * Whether this block can be split. * Allocates a block from the list, splitting if needed. // Split the larger block, reusing the free part. With splitting we have now good reuse of the free space. Yet however, if we have two fee adjacent blocks on the heap of size 8, and a user requests a block of size 16, we can’t satisfy an allocation request. Let’s take a look at another optimization for this — the blocks coalescing. On freeing the objects, we can do the opposite to splitting operation, and coalesce two (or more) adjacent blocks to a larger one. * Whether we should merge this block. * Coalesces two adjacent blocks. * Frees the previously allocated block. Notice that we coalesce only with the next block, since we only have access to the next pointer. Experiment with adding prev pointer to the object header, and consider coalescing with the previous block as well. Blocks coalescing allows us satisfying allocation requires for larger blocks, however, we still have to traverse the list with O(n) approach in order to find a free block. Let’s see how we can fix this with the explicit free-list algorithm. Currently we do a linear search analyzing each block, one by one. 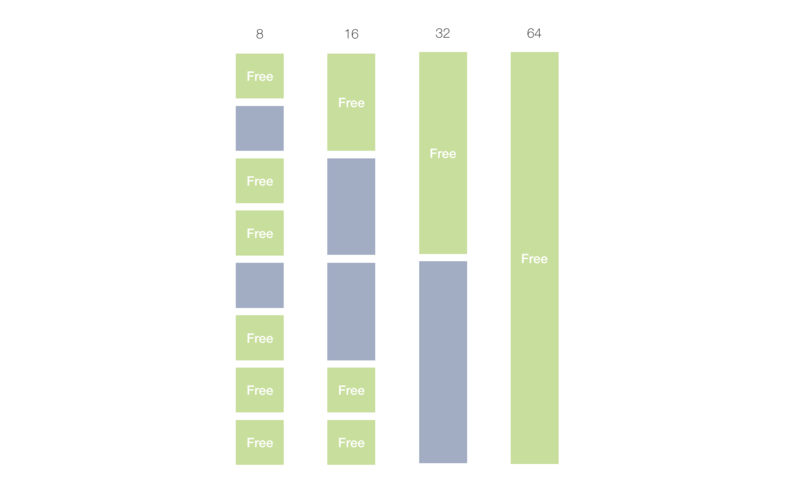 A more efficient algorithm would be using an explicit free-list, which links only free blocks. This might be a significant performance improvement, when the heap is getting larger, and one needs to traverse a lot of objects in the basic algorithms. An explicit free-list can be implemented directly in the object header. For this the next, and prev pointers would point to the free blocks. Procedures of splitting and coalescing should be updated accordingly, since next, and prev won’t be pointing to adjacent blocks anymore. * appropriate size reuse the free blocks. Experiment and implement a doubly-linked list approach, using next, and prev in the header for the free-list purposes. Finally let’s consider one more speed optimization, which brings much faster search for blocks of predefined sizes. The approach is knows as segregated list. Considered above searching algorithms (first-fit, next-fit, and the best-fit) do a linear search through the blocks of different sizes. This slows down the search of a block of an appropriate size. The idea of the segregated-fit is to group the blocks by size. That is, instead of one list of blocks, we have many lists of blocks, but each list contains only blocks of a certain size. In this example the first group contains blocks only of size 8, the second group — of size 16, third — 32, etc. Then, if we get a request to allocate 16 bytes, we directly jump to the needed bucket (group), and allocate from there. There are several implementations of the heap segregation. One can pre-allocate a large arena, and split it on buckets, having a contiguous array of buckets, with fast jumps to needed group and a block within a group. Another approach is to have just an array of lists. Example below initializes these segregated lists. When a first block of the appropriate size is allocated, it replaces the nullptr value in the bucket. Next allocation of the same size chains it further. And the actual search within a bucket can reuse any of the considered above algorithms. In the example below we reuse firstFit search. * based on the size. // Bucket number based on size. OK, we have optimized the search speed. Now let’s see how we can optimize the storage size. Currently object header is pretty heavy: it contains size, used, and next fields. One can encode some of the information more efficiently. For example, instead of explicit next pointer, we can get access to the next block by simple size calculation of the block. In addition, since our blocks are aligned by the word size, we can reuse LSB (least-significant bits) of the size field for our purposes. For example: 1000 — size 8, and is not used. And the 1001 — size 8, and is used. * Object header. Encodes size and used flag. * Whether the block is used. * Sets the used flag. This is basically trading storage for speed. In case when you have a smaller storage, you may consider such encoding/decoding. And vice-versa, when you have a lot of storage, and the speed matters, using explicit fields in structure might be faster, than constant encoding and decoding of the object header data. As was mentioned above, on Mac OS sbrk is currently deprecated and is emulated via mmap. What is deprecated is the specific function, and on specific OS. However by itself, the sbrk is not just a “function”, it’s the mechanism, an abstraction. As mentioned, it also directly corresponds to the bump-allocator. Production malloc implementations also use mmap instead of brk, when a larger chunk of memory is requested. In general mmap can be used for both, mapping of external files to memory, and also for creating anonymous mappings (not backed by any file). The later is exactly used for memory allocation. * Allocation arena for custom sbrk example. // virtual heap for custom sbrk manipulation. //    to the beginning of this arena. // 1. If `increment` is 0, return current break position. //    the arena, return -1. At this point we’re finishing our discussion about memory allocators, and in the next lectures will be working already with garbage collection algorithms. As we will see, different collectors work with different allocators, and designing a memory manager requires choosing a correct correspondence between the collector, and allocator. Try solving all the assignments yourself first. If you’re stuck, you can address the full source code with the solutions here. If you have any questions, or suggestions, as always I’ll be glad to discuss them in comments. And see you in the class! Thanks for your work, great explanation. I’m wondering if the object header is always located together with the data block? @Alex Levine, thanks for the feedback, glad you liked it. if the object header is always located together with the data block? This is purely implementation-dependent. Co-locating the header with the user data is the usual approach (see this example). However, other malloc implementation can store it in different location. thank you, sir, crystal clear! one question: in custom sbrk, when mmap arena is exhausted, what happens? @saurabh nair, thanks, glad it’s useful. As for arena, once it’s exhausted, and collector didn’t reclaim anything, you can simply extend the arena, or allocate another one, and chain them. Thank you for the lecture! I love your classes. Ive’ a question. How does garbage collector distinguishes pointers from numbers? @Jeremy Chen, thanks for the feedback! How does garbage collector distinguishes pointers from numbers? That’s a good question, and this depends on the implementation. For example, conservative collectors (such as Mark-Sweep for C++) treats any number which looks like a pointer as a potential pointer (such number should be address-aligned, and be in the range-addresses of the heap), and tries to reach it. Other systems can use addition encoding for data, and distinguish directly numbers from pointers. Hi, thank you for your lectures. They are self-contained and really well explained. 1. When are the remaining lectures coming out? Any estimated time? 2. What do you use to make your slides? They look beautiful! @Hari, thanks for the feedback, glad it’s useful. I teach these classes offline, and need to convert them to video format. The other lectures are coming soon, including for other classes as well (stay tuned!). As for the slides, I use combination of tools: Good Notes/Notability, Keynote, After Effects, live drawing and editing, etc.